Every sight word included in this packet has two worksheets focused on teaching that word. Students trace, rainbow color, spin and tally, search for and use beginning consonant sounds to “find” the mystery word for each sight word on one worksheet. Students then trace, rainbow write, search, write, box up, cut and paste the word on the other worksheet. A clear, straight forward and simple, not so busy design make these worksheets ideal for younger students. 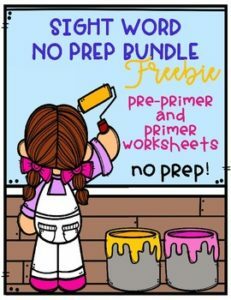 If you enjoy these worksheets, I hope you will check out my full bundle and consider leaving feedback and following me for other freebies and great products!